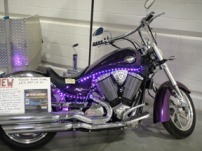 This is a picture of a purple street bike that was on display in the Brite Lites booth in Milwaukee last month. The bike has our new Remote control Multi color LED strips on it and we had it Lit' UP all weekend to show the new kit off. The single kit has 6 different length LED strips in it to outfit a complete bike. this bike has one kit on and no splicing, soldering or fancy stuff was done to put this on and make it work. Can stay on any color you pick from the remote, or run programs at speeds you select from nice and slow to strobing fast! Remote Control to any color or program!